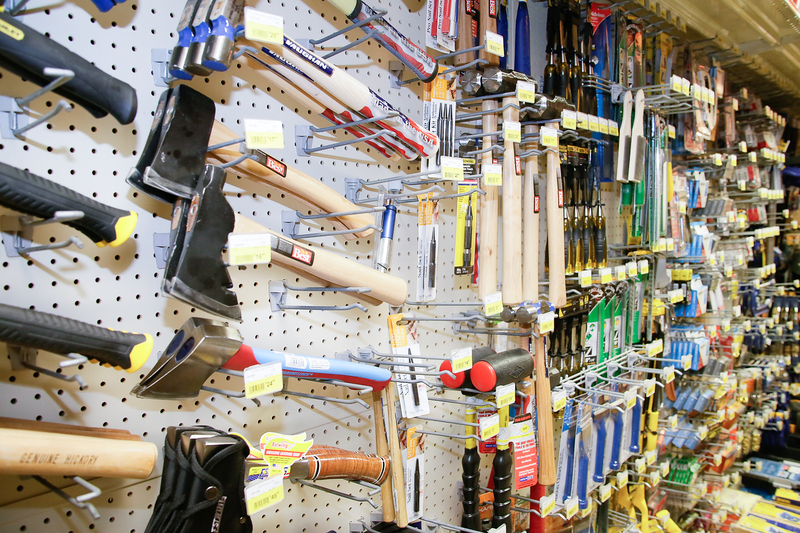 Woodstock Hardware stocks a full line of quality hand and power tools. Our wide selection of hand tools and accessories provide the tools to meet the needs of our homeowners and professionals alike. These tools help us to perform tasks that are easy as well as those that otherwise would be difficult or impossible. We have all used a hammer and a screwdriver. But how many of us have used a reverse thread screw extractor to remove an old broken off one in a piece of heavy metal? Or who has used a tap to repair damaged threads? So maybe a 6 in 1 screwdriver will best suit your needs to tighten up those loose cabinet doors but an electrician won’t be satisfied without a specialty Klein conduit screw driver. 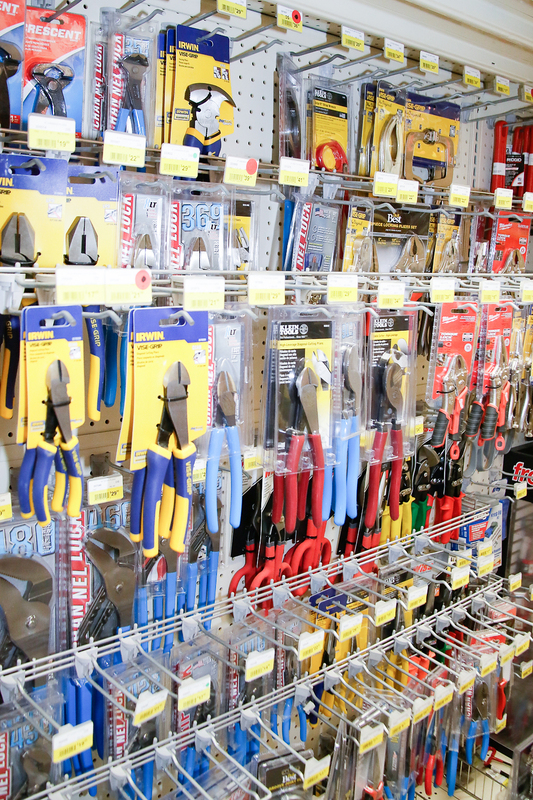 Whether you are looking for a screwdriver, a nail set, a hammer, a stair gauge, maybe a wrench, pliers, or a dove tail saw, a square, level, or bevel, Woodstock Hardware has the hand tools and accessories you need. In addition, we have a full line of quality corded, and battery operated, power tools and accessories. When you need your next drill, sander, or pex exapansion tool stop in and see us. Visit Woodstock Hardware’s Power Tool and Accessory Department . In addition to the hand tools and accessories you need, with over twenty-five years of experience, Woodstock Hardware can provide you the technical expertise required to help you successfully complete your next project. Struggling to pry the plug out of a hole saw? Drive a long screw into the plug. When the screw hits the back of the hole saw, keep driving and the screw will magically pull out the plug. If the plug is really stubborn, you might have to add a second screw on the other side of the drill bit. Then alternate between the screws, turning one and then the other until the plug is out. Need to stop a wondering drill bit? Even the sharpest bit tends to skate across hard materials like tile, metal or glass, leaving loopy scratches behind. To steady a wandering bit, give it a softer place to start. Thin cardboard taped firmly in place, works perfectly. Magnetize a Screwdriver. This old trick could save you hundreds of dropped screws over your lifetime. Grab a magnet and rub it along the shaft of a screwdriver a dozen times or so. Rub in one direction only, kind of like sharpening a knife. In about 10 seconds, you’ll have a magnetic screwdriver. Repeat as needed. Whether you need a 1″, #2 square drive screw tip, a speed square, a 3# engineers hammer, or a nut driver, you will find all of the hand tools and accessories to satisfy everyone, from the homeowner to the professional builder, from the most basic hand tools to quality specialty tools. And we have all the accessories you need to complete your job right.